The lens has a focal length of 17-55 mm. Since the lens is designed to be used on a camera with smaller sensor ('APS-C') the focal length will be equivalent to 26-82 mm on your Nikon camera. A feature worth commenting, which is also related to lens brightness, is that the brightness and maximum aperture-value remains constant regardless of focal length used. This makes it easier for you as a photographer. No matter if you are have the focus ring and focal length at 17 mm or at 55 mm the aperture value can be f/2,8. If you buy this lens it will come with a lens hood, whose model name is "HB-31". 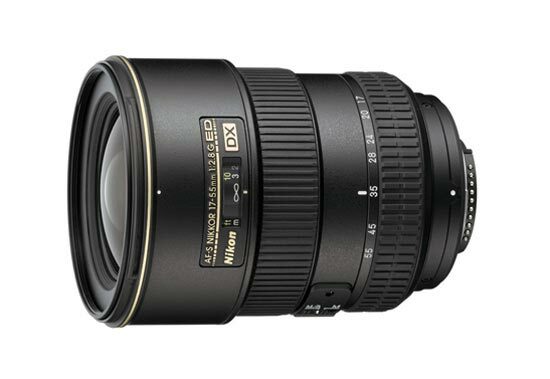 "The Nikon 17-55mm f/2.8 AF-S is a tough f/2.8 pro lens. If you need a fast midrange zoom, it's the only lens I'd consider for DX cameras. I'd never use a Sigma or Tamron; they always feel so junky in my hands. Personally, I shoot the 35/1.8 DX in low light, and pass on zooms in good light. If I do use a zoom, it's a lighter-weight 18-55mm, or longer-range 18-200mm VR. I wouldn't bother with the hood. I'd leave it at home in the box for resale later. We're all different, which is why Nikon makes so many different lenses. This 17-55/2.8 is a superb lens for anyone who needs a big, fast, tough midrange zoom for DX. For most uses, the all-plastic 18-55mm VR does the same thing for much less money. Don't even consider the full-frame FX 16-35mm f/4 VR for use on DX; this 17-55mm lens is a much better idea on DX. You're wasting most of the performance of the 16-35 if you're only using it on DX; leave the 16-35mm for FX shooters."